In Strauss's "Capriccio," heard last week at Santa Fe Opera, the Countess settles on Gluck as setting the highest standard for opera. 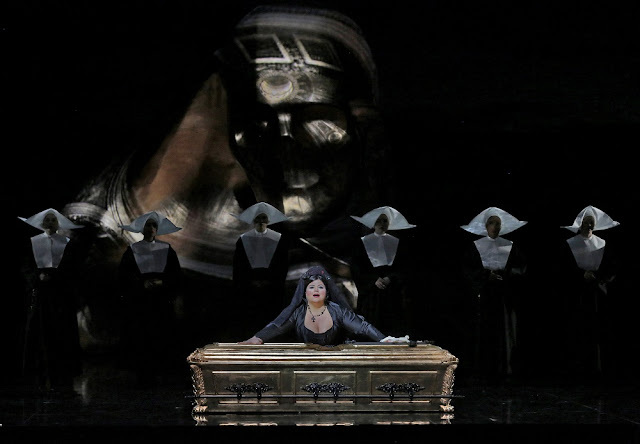 If only Santa Fe Opera had heeded her advice and replaced its annual Mozart opera with one by Gluck, as I suggested to Charles MacKay a few years ago. Mozart may be a staple at Santa Fe Opera, but Mozart is rarely the highlight of any season here. For the last truly extraordinary Mozart production at Santa Fe Opera, you would have to go back to "Lucio Silla" in 2005. This year's "Don Giovanni," last heard here in 2009, had that same feeling of routine Santa Fe Opera Mozart, mostly pleasant but with some inevitable disappointment. A nice staging of Gluck's "Iphigénie en Aulide" would have been just the thing to lift the season into something extraordinary. The piece came to life a bit more in the recitatives, when Glenn Lewis took over on the fortepiano, seated at the left corner of the pit so he could see and interact with the singers. The superlative recording led by René Jacobs showed how the fortepiano, played with improvisational fancy, can enliven the recitatives in this opera. Lewis was not quite on the level of that recording, but he worked in witty allusions to other arias, for example, when some characters were mentioned.